The Bauhaus Nesting Side Tables were designed by Josef Albers in 1926. The four piece set we offer is a faithful reproduction from the original Josef Albers design and is fully authorized by the Albers Foundation. The Albers Foundation is a non-profit organization set up to promote and preserve the life work of Bauhaus alumni and faculty, Josef and Anni Albers. 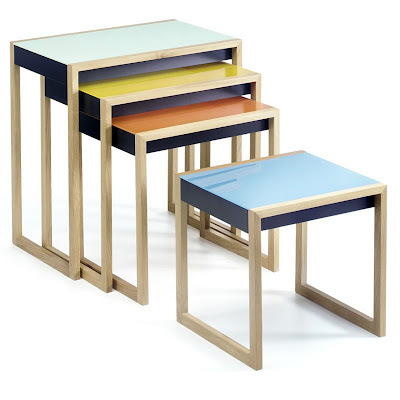 The Josef Albers Bauhaus side tables have beautiful saturated colors. The Josef Albers Bauhaus side tables were designed in 1926-27 for the Fritz Moellenhoff (Berlin psychoanalyst) family's apartment, together with other furnishings, of which many pieces did not survive the war. These modernist side tables use the colors favored by the Bauhaus: yellow, red, and blue. Josef Albers was a pioneer of twentieth-century modernism and an influential teacher, writer, painter and color theorist Josef Albers is best known for the Homages to the Square he painted between 1950 and 1976 and for his innovative 1963 publication The Interaction of Color. Significant pieces by Josef Albers are part of the permanent collection of the MoMA in New York.